Angry Wookiees, big spaceships, and Lando Calrissian, oh my! We finally got another look at Solo: A Star Wars Story last night, and it gave us a much better idea of what we can expect from the movie after that first, cryptic trailer in February. Here’s everything we learned about this early chapter in the life of Han Solo and his friends, both familiar and unfamiliar. The trailer opens with some gorgeous shots of Corellia, Han’s homeworld—specifically, the Imperial presence on the planet, with the sounds of TIEs filling the air as a Star Destroyer is built in the lower atmosphere. Although the old EU made Corellia more of a seedier place that largely kept out of the eyes of the Moffs ruling its sector, Han suggests in A New Hope that the Imperials built vessels on the planet (big ships that he boasts he could outrun). Next, we cut to an extended shot from the first trailer—Han Solo (Alden Ehrenreich) on a desert world, in a very Western-style showdown with a gang of alien thugs. The lead figure is one of the big villains of the film, named in merchandise as Enfys Nest—a recent French magazine gendered Nest as female, which, if it ends up being accurate, means she joins a rather select group of female Star Wars villains. And if the merchandising holds out, behind her are her swoop-bike gang, the Cloud-Riders. The Cloud-Riders are a deep Star Wars cut, a reference to a gang of troublesome bikers Han fought in the very first original storyline of Marvel’s 1977 Star Wars comic (which began in issue #8). While Qi’ra narrates we get another extended look at a shot from the first trailer: Han entering a cantina and coming face-to-face with Lando Calrissian (Donald Glover). We get to see Han throw down a big pile of credits, which seems like this is all set up of the card game in which Han famously wins the Millennium Falcon off the future Baron Administrator of Cloud City. But dialogue we hear from what appears to be the same scene later in this trailer hints that this is the first time Han and Lando actually meet each other, which would be a weird time to have Han actually earn the Falcon. But it also sounds like a very Han Solo move, so who knows? We still don’t know much about where this place actually is, except for what we learned through, of all things, a Denny’s commercial. Even then, it’s vague: at a press event for the ad, it was simply described as a “lodge” where Han and Lando play their fateful Sabacc game. Han and Chewbacca (played in Episodes III-VII of the main saga and sequences in VIII by Peter Mayhew, but played full time by Joonas Suotamo in Solo, who also worked with Mayhew in The Force Awakens and The Last Jedi) survey the fabled Millennium Falcon. Given Han’s wearing the bulky cold-weather coat we’ve seen him wearing on the ice planet for the Conveyex train heist, it’s possible this is the same world and where the lodge he meets Lando is based. “You look good. Little rough around the edges,” Qi’ra tells Han, this time in the glitzy party environment we saw a few shots of in the first trailer—which appears to be the hangout of choice for Paul Bettany’s “space gangster” character, Dryden Vos, who we’ll meet shortly. Qi’ra’s dialogue makes it seem like this is one of the first times she and Han have spoken to each other in a while, perhaps since they were on Corellia together. “Heard about a job,” Han’s new mentor Tobias Beckett (Woody Harrelson) says, as we cut from Beckett and Han—which looks like the same world Han stared down Enfys Nest—to Vos lording it over his fellow partiers. “Big shot gangster, putting together a crew,” Beckett continues presumably referring to the Vos. This is our first look at the character, who was originally going to be played by Michael K. Williams before reshoot scheduling issues saw the actor drop out. Vos was allegedly meant to be a mocap character when Williams was playing him—Williams himself described Vos as “half-mountain lion, half-human”—but now he just has a really messed up face. Merchandise revealed this morning indicates that these scenes are on the planet Mimban, which in the old EU was known for being the setting of Splinter of the Mind’s Eye, the very first Star Wars novel set after the events of A New Hope—here, it’s a hub of Imperial activity. We know, thanks to the Lego sets, at some point in the movie Han and Beckett go in disguise in these Imperial outfits on the planet, and previously shown action figures of a very muddy Han also indicate Chewbacca is on Mimban, too. Given the old EU’s backstory of Han liberating Chewbacca from slavery when he was serving in the Imperial Navy, forcing the two to go on the run together, Mimban could possibly be where Solo and his Wookiee pal first meet. “I’ve waited a long time for a shot like this,” Han continues, as we cut back to another extended scene from the first trailer, back on the snowy planet where the train heist takes place. We get the same shot of Val (Thandie Newton) as we did in the first trailer, so there’s nothing new to learn there. But we also get what appears to be a crucial moment in Han Solo’s legacy, albeit played reservedly: Beckett sniffs, and then tosses Han what would become Han’s iconic blaster, the BlasTech DL-44. I’m all for more seemingly huge Star Wars art-facts not having to have grand stories behind them, so playing it pretty low-key here is nice. After a brief joke between Han and Chewie, we see the two, joined by Qi’ra, entering what appears to be the lodge where they find Lando. The dialogue here seemingly confirms this, as Beckett asks if the team has found a ship, only for Qi’ra to offer that she knows a guy, “the best smuggler around.” Sorry, Han, but she’s definitely talking about Lando. The snowy environment this takes place on suggests that this is the planet Han and Beckett pull the Coneyex heist,too. It’s hard to tell if this meeting is before or after that sequence, but either way, it seems like a lot goes down on this icy world. Back to the card game in the lodge between Han and Lando: Han begins to inquire about stories he’s heard of Lando’s smuggling exploits, only for Lando to counter with both the line “everything you’ve heard about me is true” followed by the smoothest drink acquisition the galaxy far, far away has ever seen. Lando is a stylish, stylish man. 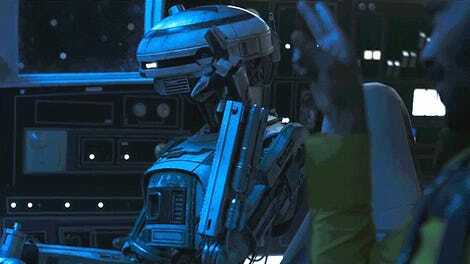 Next up, another meeting in the lodge, as Lando picks up his droid co-pilot L3-37, voiced by Phoebe Waller-Bridge, to depart with the rest of the team. Like the very best Star Wars droids, she balances a fairly demure personality with a dash of violence. Han ogles the Falcon’s swanky looks on the inside and out—a do-up by Lando, and apparently not the first time the old freighter has been given a fresh lick of paint and a design tweak. 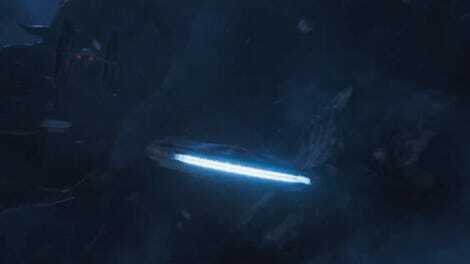 The wide shot of the ship indicates that this indeed all takes place on that snowy planet, so presumably it (and the heist sequence) happen pretty early on in the movie. Another extended look of a scene from the first trailer, this time with Beckett warning Han: “If you come with us, you’re in this life for good.” We know he (and Chewie) say yes to this offer. Whether this is pre-or-post Conveyex heist is unknown, but it seems like it’s more likely to be before it. We finally get a bit more of the Conveyex heist, with Beckett trading blaster bolts on its exterior with Imperial Range Troopers. Aside from being cool as hell—come on, train shootout on a rotating train!—this is actually our first really good look at the Range Troopers in the film. We’ve only previously seen them as toys. The Falcon jets off to another planet, which is decidedly steamy. Given that the Falcon’s there and Qi’ra is hanging out, this is definitely after the team meets Lando on the snow world. (It’s kind of crazy we’ve yet to learn a lot of the planet names in this movie, but there’s still a month and change to go!) Could perhaps even be the fabled spice-mining world of Kessel? Chewbacca and what appears to be a female Wookiee embracing! The environment suggests that this is again the steam-covered world we saw the Falcon jetting off to (and the site of a major shootout sequence we see peppered throughout the back half of this trailer). If it is Kessel, the EU made it an unfortunate home for Wookiee slaves and Imperial criminals to work in the spice mines, so it’d make sense Chewie would know the fellow Wookiees that were sent there. Could this perhaps even be a Wookiee he’s related to? Chewie’s family—his wife Malla, his son Lumpy, and father Itchy—was created for the infamous Star Wars Holiday Special and stricken from continuity, but Malla at least was recanonized in the Disney era through the young readers novel A New Hope: The Princess, the Scoundrel, and the Farm Boy, and then the Aftermath trilogy of books. Whatever the relationship, this is clearly a Wookiee Chewbacca has a lot of affection for. Back to another sequence seen in the first trailer, and what has long-been speculated about as part of the infamous “Kessel Run” that Han spends the rest of his life bragging about. Imperial fighters chase the Falcon through a stormy nebula that also seems to be home to a giant tentacle monster. 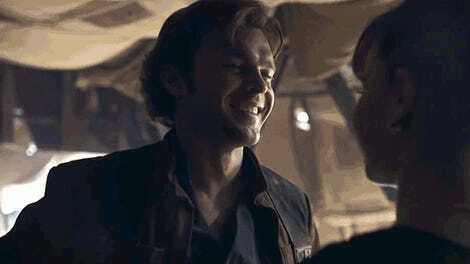 “I have a really good feeling about this,” Han gleefully adds. You see what they did there? Meanwhile, Chewie gets up from the backseat to do some co-piloting himself, leading to a joke that reveals something actually pretty important: Chewbacca is 190 years old by the time of Solo. The Force Awakens prequel novel Smuggler’s Run - A Han Solo & Chewbacca Adventure confirmed that Chewbacca was 180 when he took part in the battle of Kashyyyk in Revenge of the Sith, in 19 BBY (before the battle of Yavin) so now we can vaguely estimate that Solo is taking place at around nine-to-10 years before A New Hope. Rest easy, timeline nerds. There’s more from Mimban here, as hordes of Mudtroopers do battle (presumably against Rebel scum)... and then Chewbacca just completely destroys a man’s head. 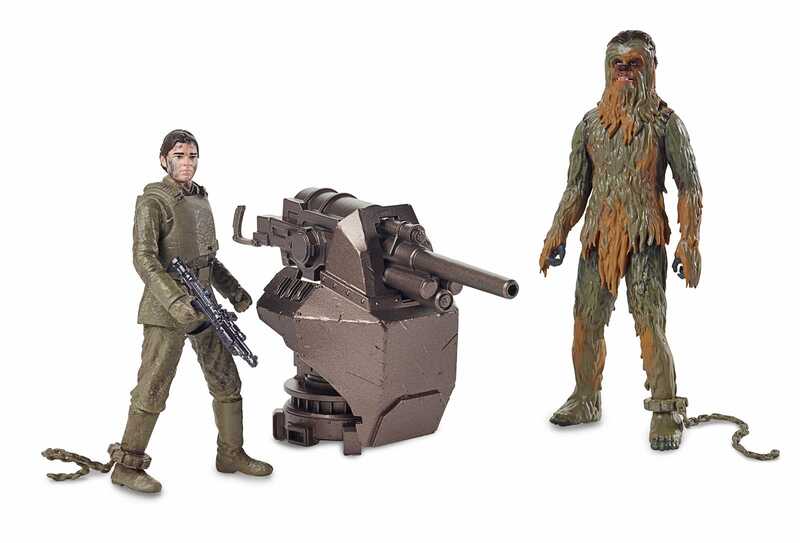 This also appears to happen on Mimban, given the clothing and general environment, further confirming beyond just the toys that Chewie is on the planet at some point, too. Back on the steam planet/maybe-Kessel one last time, as Qi’ra and L3 lead an attack out of the Falcon. L3 in particular is very excited: “So glad we took this job!” Same, L3. Same. Finally, the trailer ends once again with part of the Conveyex heist, as Chewie takes a tumble. Could this be the end of a character we know will go on to appear in at least six movies set after Solo? Who can possibly say?? Although it still keeps its Sabacc cards close to its chest, this new trailer does give us a few clearer ideas of what we can expect of Solo, expanding on a few of the things barely glimpsed in the first trailer, while also giving us a better idea (albeit still a vague one) of the larger picture and flow of the film. But even then, there’s still so many questions about just what we we’ll be learning about Han’s early life, and even more about the intriguing company he keeps in this trailer. Regardless, it won’t be that long until we know more—Solo: A Star Wars Story hits theaters May 25. Whet Your Appetite For New Solo Footage With This...French Car Commercial?